Not your fathers survival tool. This all in one device does it all from setting fires to cutting bark and food. 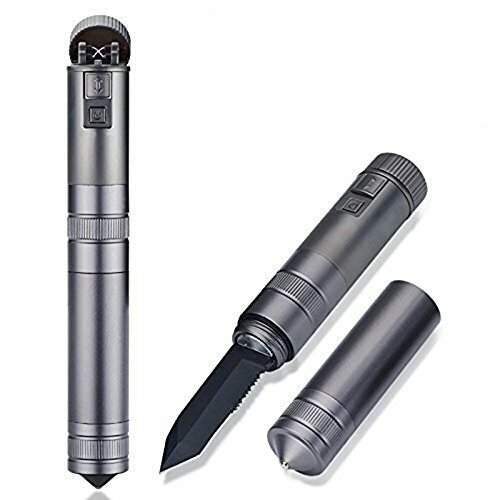 3-in-1 SURVIVAL TOOL - A rechargeable dual arc plasma lighter, a carbon steel serrated knife and a glass breaker/hammer tip. 1 YEAR WARRANTY INCLUDED - Every Saberlight purchase comes with the peace of mind of a 1 year extended warranty which is included free of charge. You will be emailed your warranty 2 days after purchase. We also offer an industry first money back guarantee - You'll absolutely love your Saberlight or your money back! If you have any questions about this product by Saberlight, contact us by completing and submitting the form below. If you are looking for a specif part number, please include it with your message.